I am so very excited and very honored to announce that Stephanie has invited me to be a part of her Whimsical Wednesday Design Team! I love the fun challenges they hold every Wednesday and her team is absolutely amazing! They are so talented and very encouraging! If you have never been there before, you must stop by and check it out (and if you have been there, you know how fantastic they are)!! Wait until you see the love and talent on the team she has chosen! On Friday July 8th we are going to be having a super fun and very special Blog Hop! Please join us...the fun will start at 7:00 pm EST!! Also, the challenge this week is so touching and such a powerful reminder of what we as a crafting community can do for the good of others! This week the DTs came together to make cards for a very special little boy named Angelo. He is the 15 month old grandson of Margie, from Bella Bug Creations and he just underwent brain surgery to remove a tumor. You can read more about Angelo on Margie's blog. The Whimsical Wednesday team is challenging everyone to create Get Well cards to send to this amazing little guy to bring cheer to him and his family! As a mother of three, I feel so fortunate and I thank God that my children are healthy! I cannot even begin to imagine what their family is going through! I plan on working on my card this weekend and getting it sent off. The challenge details are available at Whimsical Wednesday and I hope everyone can find the time to create a very special Get Well card for Angelo! 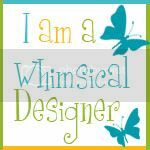 Stop by Stephanie's blog Always Crafting and welcome the rest of the new Design Team! Thank you for stopping by today and thank you so much Stephanie for this amazing opportunity!! Congratulations to you! Enjoy the new DT! That is wonderful news! I will be sure to hop along with you in the hop. Have a great weekend! Whoohoo! Congrats! You are going to do an amazing job! Congrats!! !See you at the hop!!! yay! congratulations! can't wait to see what you make. Congratulations!! I will have to check out the challenge and remember to hop along! Stop by my new craft blog, Made Especially For You. Congrats! I can't wait to see how you're going to rock this! Congrats to you and the new DT! I am excited to follow and see what you come up with. I am always inspired by your work!! Congratulations on your new position! How exciting! super excited about being on the dt team also...cant wait to play along with you and the rest of the team!! i think were going to have a lot of fun! Whoo Hoo! Congrats on your WW DT spot! I am so very excited to be working with you and to see all your amazing creations!! Can't wait to see what you come up with for this weekends hop! Congratulations I'll look forward to seeing some super designs from you. Congratulations!! You will be awesome!